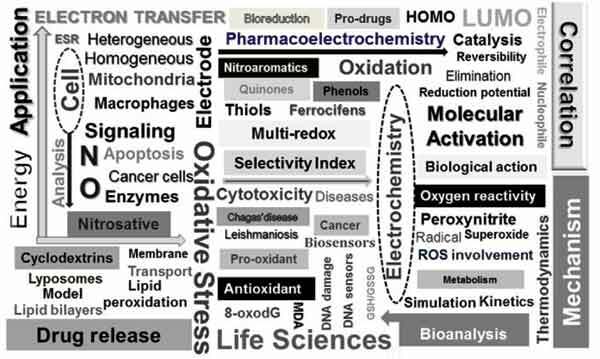 This review discusses the state of the art, challenges and perspectives in recent applications of electrochemistry in the life sciences. It deals mainly with the elucidation of molecular mechanisms of drug action, drug design and development, involving electron transfer, pharmaco-electrochemistry (the combination of electrochemical and pharmacological assays), and electrochemical studies of membrane models and drug delivery. It aims to shed light on the question: does electrochemistry really contribute to this area? It includes a general introduction for the use of electrochemistry in the life sciences, with a focus on how electrochemistry can uniquely provide both kinetic and thermodynamic information. A number of studies are reported in the literature and from the authors’ laboratories, including the investigation of biooxidative/bioreductive activation of pro-drugs, DNA alkylation, electrochemically- based release of reactive oxygen and nitrogen species, with a particular emphasis on quinones, ferrocifens and compounds with mixed-functionality. Within the context of drug delivery and bioavailability, the electrochemical investigation of supramolecular interactions of the chosen classes of compounds with cyclodextrins and lipid bilayers, in relation to their solubilization and vectorization was also carried out. The updated examples herein illustrate how relevant and challenging the integration of electrochemistry, supramolecular and materials chemistry, biochemistry and medical knowledge for the design and development of redox-selective molecular approaches is. Many questions related to these fields are still unclear and the search for selectivity toward redox therapeutic agents remains of expanding interest. This review hopes to stimulate researchers to become more involved in this fruitful interface between electrochemistry and the life sciences. Electrochemistry, Quinones, Ferrocifens, Oxidative stress, Biooxidative/bioreductive activation, DNA, Cyclodextrin, Lipid bi-layers. Instituto de Quimica e Biotecnologia, UFAL, Maceio, Al, 57072-970, Brazil.